A sentiment to all things chic, the Loco Rococo cupcake stand is the ultimate companion for cocktails and cupcakes! A sentiment to all things chic, the Loco Rococo cupcake stand will have even the most high brow of guests “oohing” and “ahhing”. This ware is the ultimate companion for cocktails, cupcakes and juicy gossip so crack open the bubbles and dish, dish, dish darling! 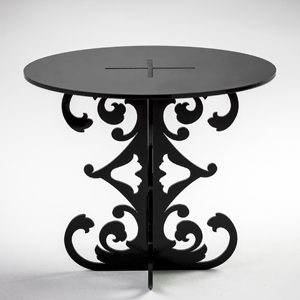 Loco Rococo is available in any of our 14 colours but we think it looks stunning in black, white or our deep red. Cut from sturdy 3mm acrylic, the top plate is 17cm wide and will hold 4 generous cupcakes or up to 10 mini cupcakes. Alternatively it will hold a 6 inch lightweight cake. Assembled dimensions: height 15 cm; width 17 cm; top plate diameter 17 cm.